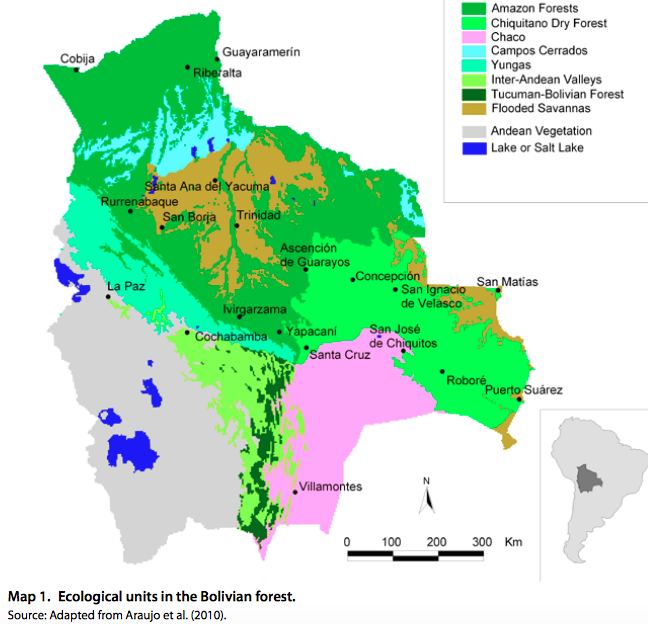 About of half of Bolivia is covered by forests. Around 40 out of 50 million ha of forest grow in the lowlands. There are significant pressures on these forests, which have increased over time. About 200,000 ha of forest are lost annually, mostly in the lowlands. The three main proximate drivers of deforestation are mechanized agriculture, cattle ranching and small-scale agriculture. Conversion of forest to pasture for grazing caused more than half of the deforestation in 2000–2010. Mechanized agriculture, mostly for soybean production, has been responsible for some 30% of deforestation, while small-scale agriculture has accounted for some 20%. 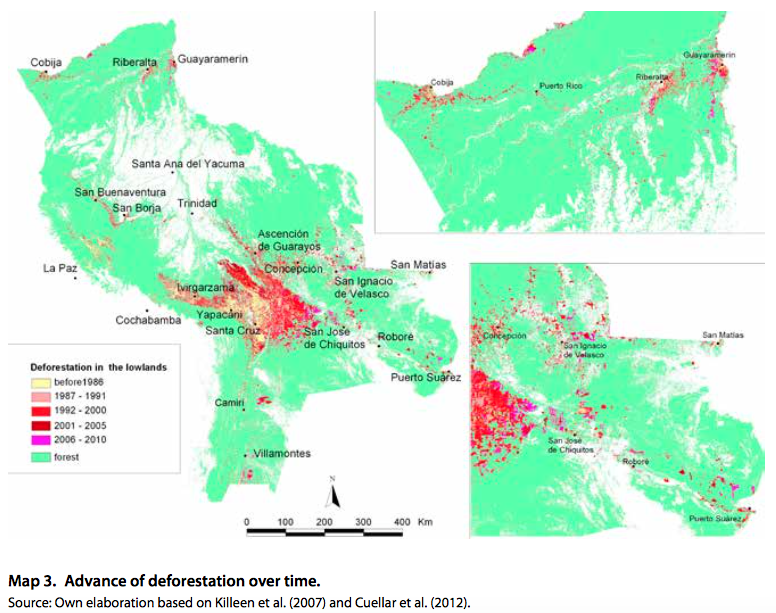 Underlying drivers of deforestation include greater integration of the agricultural economy in international markets, strong international investment, such as from Brazil and increased demand in the domestic market due to the growth of the urban population, in addition to other factors, such as road expansion and institutional weaknesses and uncertainties. Since the mid-1980s, there has been increased pressure on forests associated with agricultural expansion. Since the 1990s, various policies have been tested to regulate frontier expansion, mostly based on land-ownership regularization, land- use planning and sustainable forest management. Despite the progress, these policies have failed to reduce deforestation driven by the advance of agriculture or the predatory timber extraction with effects on forest degradation. Deforestation has now stabilized, but at a relatively high rate. In the mid-2000s, major political changes led to questioning of existing public policies over their neo liberal orientation. This criticism included a strong emphasis on alternative views such as the idea of “living in harmony and balance with Mother Earth”, which has become one of the pillars of current Government’s discourse. This resulted in a change in public institutions, reinforcing the role of the State with a more centralist perspective, but accompanied by political disputes with some departmental governments. This translated into poor adjustment of land and forest policies. Land policies focused on collective titling of indigenous territories, started by previous governments and forest policies introduced minor changes to forest regulations, especially by promoting integrated forest management regulations, control procedures for illegal logging and, more recently, regulating illegal deforestation. However, despite changes in the discourse on the vision of forest management and the importance of a more integrated and inclusive management, still no substantial changes in land and forest policy and legislation were made and a new forest law is still under discussion. As regards the Bolivian position in international climate change negotiations, the government initially was a staunch supporter of the proposal for reducing emissions from deforestation and forest degradation (REDD). However, this position changed when Evo Morales took office. The new government assumed a position against the marketization of nature and in favor of climate justice. This position was largely identical to the one of the World People’s Summit on Climate Change in 2010, which was defended by the government of Bolivia at the international level. However, Bolivia eventually adopted a more proactive position that has resulted in emphasizing the importance of mechanisms that are not market based. In this context, the government of Bolivia has created the so-called “Joint Mitigation and Adaptation Mechanism for the Integrated and Sustainable Management of Forests and Mother Earth”. The proposal was formally adopted as public policy in the Law of Mother Earth, approved in 2012 and its regulatory decree of 2013. In addition, the Plurinational Authority of Mother Earth and the Plurinational Fund of Mother Earth were created. However, these efforts seem to be insufficient to address two major challenges in the Bolivian environmental agenda. The first is to reverse important economic forces that create increased pressures on forests, particularly as a result of persistent expansion of cattle ranching and medium- and large-scale mechanized agriculture, along with the continued progress of new settlements, which are also encouraged by a parallel discourse of the government to support food production and food sovereignty. The second challenge concerns the weak capacities of public institutions at different levels to effectively implement laws and to also promote coordinated actions with civil society to move towards proposals for more integrated land and forest management fostering the conservation of multiple forest functions. The new policy, as it is referred to in this paper, has assumed these challenges and proposes addressing them by setting up platforms for local to regional territorial negotiations and locally to regionally agreed action plans, supported by monitoring systems not centered in carbon stocks but also for other forest functions. This document includes a thorough analysis of the drivers of deforestation and proposes a number of specific policy recommendations. 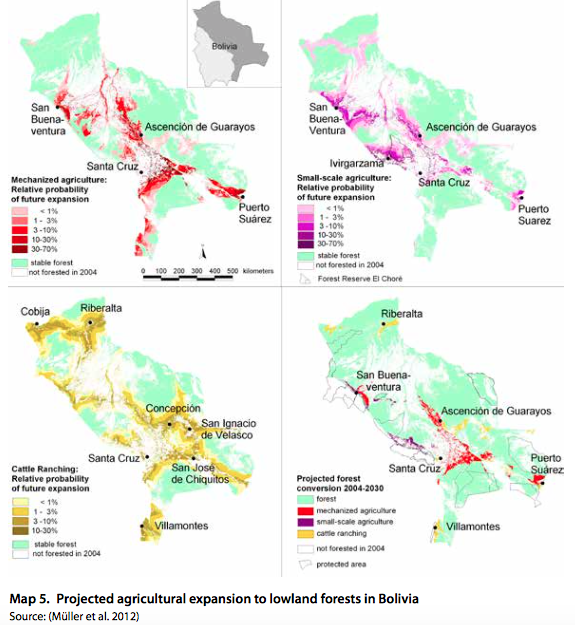 We suggest that potential mitigation measures need to take into account the stage of forest transition, distinguishing the areas of the agricultural frontier from areas with still intact forests and, finally, areas dominated by mosaics of agriculture and remaining forests. Our analysis suggests that a priority measure to mitigate forest loss in agricultural frontier areas would be to control the expansion of cattle ranching on forest lands, as well as to improve efficiency to increase production in existing pastures. Options to reduce deforestation associated with mechanized agriculture are more limited because it tends to occur on good soils where it can be highly profitable. As regards small-scale agriculture, potential measures need to take into account the large number of stakeholders, which implies the need to advance in a participatory manner towards improved soil use resulting in increased economic benefits. 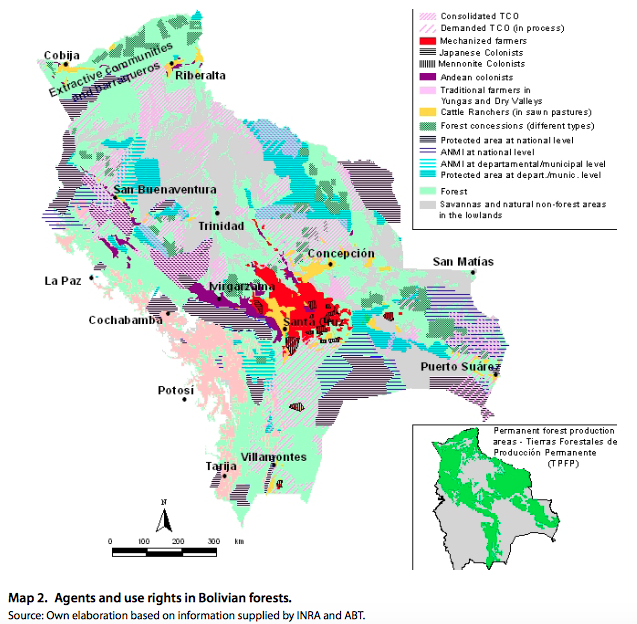 Regarding the country’s remaining vast areas of forest, the suggestion is to support sustainable uses and improve measures of conservation, taking advantage of the fact that many of them are in indigenous territories or lands occupied by agro- extractive communities, protected areas and forest concessions. In already intervened areas, actions should focus on improving agricultural production, in order to diminish the pressure on forest areas. Forest restoration is indicated in specific cases, but the priority is on mitigating the conversion of existing forests. Through the Joint Mechanism, the new policies aim to support models of integrated and sustainable forest management that have been developed by local experiences and knowledge of indigenous peoples and other traditional groups. This adds to the idea of reinforcing integrated management actions for indigenous territories and traditional and agro-extractive communities and providing these people with the financial resources needed to support their initiatives and thus stop external pressures on the large extents of forests controlled by these groups. Another proposal is to support larger-scale forest-use in public forests, both for timber and non-timber products and thus prevent slow forest conversion to agricultural land. Gradually, a more integrated perspective has been added to the Bolivian proposal, which considers agricultural-uses in larger landscapes as well as the multifunctional uses of forests and their links with agriculture. The Bolivian proposal is at the point of moving from a simple proposal to practical policy actions. It is strongly criticized because, although it advocates for a more harmonious relation between society and nature, it lacks specific actions and policy instruments as well as the necessary financial resources that would be needed to support initiatives that secure of forest services and, at the same time, improve livelihoods and food supply. Our analysis highlights that, as long as discourse and policy instruments do not account for the current reality of growing threats on forests, efforts may not achieve the expected ambitious results. It is important to note that the Bolivian proposal of the Joint Mechanism is getting attention in international discussions on forest management and the role of forests in climate change adaptation and mitigation. This is because the proposal calls for the adoption of more comprehensive, holistic and inclusive approaches for land and forest management. In this sense, an important debate is emerging at international level on how to facilitate the adoption of more integrated and holistic approaches to forest management with wider landscape management processes to meet conservation objectives, provide livelihoods for local people, create options for economic growth and ensure food security. This entry was posted in Beni, Bolivia, Business, Cochabamba, Drug war - narcotraffick, Economics, Environment, La Paz, Politics, Santa Cruz, Social Unrest, TIPNIS, Tourism and tagged anarchy, Chuquisaca, deforestation, illegal crops, illegal land take overs, illegal settlers, Ochlocracy, Pando, public policy failures, Tarija. Bookmark the permalink.